Maserati's Hajek gets a wider role at the sports car company. MUNICH -- Maserati's UK chief Thomas Hajek has had his role expanded and will now be in charge of the Italian luxury sports car brand in 11 markets. Hajek, 49, will head Maserati operations in Germany, France, Spain, Portugal, Switzerland, Austria, Belgium, Holland, Luxembourg and Monaco as well as the UK. A German native, Hajek has wide experience with Maserati owner Fiat S.p.A. and he speaks fluent German, Italian, English, Spanish, French and Polish. 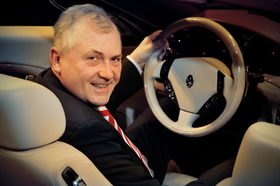 He started his international career in the Fiat Group in 1988 and has led sales and marketing activities for Alfa Romeo, Lancia and Fiat in Germany and Poland. He was also responsible for Fiat's European commercial vehicles operations based in Turin.